Lads and lassies – let us treat you this month! We know your spring schedule is filling up quickly with social events, celebrations, and more – let us help you look your best for everything you’re looking forward to. This month, we’ve got special offers in store for you including chemical peels, laser treatments, Dysport, and massages. Yes, we were downright spoiled in February with such beautiful weather. (Hopefully, it’s a sign of things to come this spring!) But first… it’s time to manage the damage. This month, we’re offering 10% off chemical peels and sun damage laser treatments with our IPL or GentleMax Pro lasers. We’ll also donate 10% of the treatment price to our community partners at True Justice International. This is a true opportunity to give back while taking care of yourself! Tune in on Monday, March 13, at 1 p.m. when Jennie hosts a Facebook Live interview with Sara Tellis of True Justice International – one of the community partners we are incredibly proud to be able to support. Jennie will interview Sara about the organization efforts to eliminate human trafficking and will host a virtual tour of “Anna’s House”. Yes, you’re reading that right. This is not a typo! Spend the morning or afternoon with us and indulge in a signature facial and 60-minute massage for just $150 this month – regularly $190. 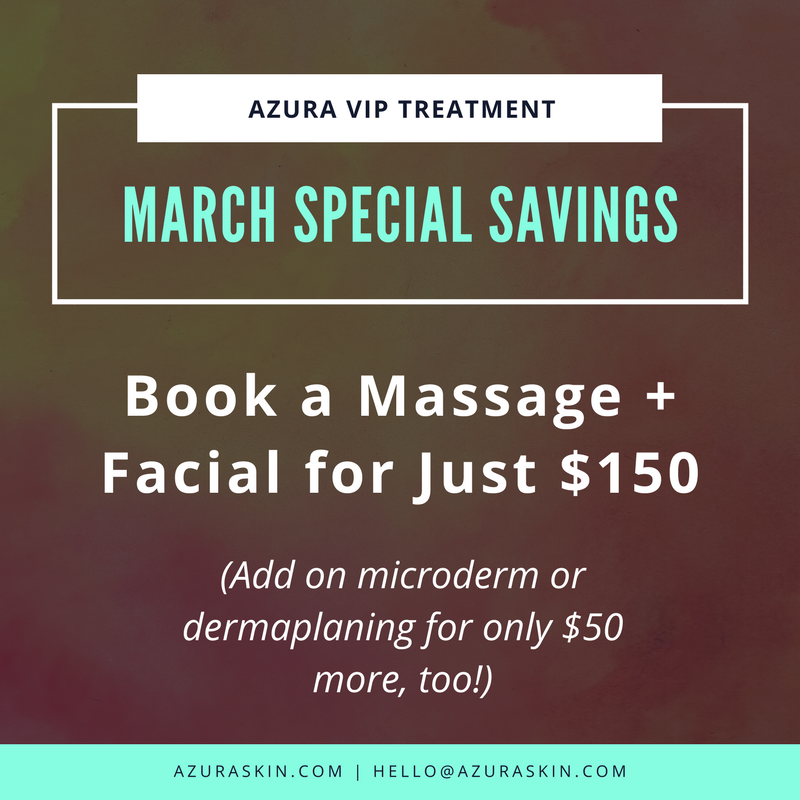 While you’re here, add on a micorderm or dermaplaning session for only $50 more. That’s three Azura services for just $200. Seriously, tell all your friends. They’ll love you for it! During March, purchase 100 units of Dysport at $4.00/unit (our everyday great price) and receive 40 units for free! This popular injectable is proven to help smooth the appearance of moderate to severe frown lines and can be used in other areas as well for fine lines and wrinkles. Dysport temporarily treats the facial muscles in just the area you want and allows the muscles in the untreated areas of your face to move normally. During the week of St. Patrick’s Day (March 17), visit Azura for any treatment and pull a ticket out of the pot of gold. Will you get a discount on Botox? Fillers? An oxygen facial? A percentage off of your product purchase? You’ll just have to stop by and see what you luck into! Bridal Boot Camp is Here! 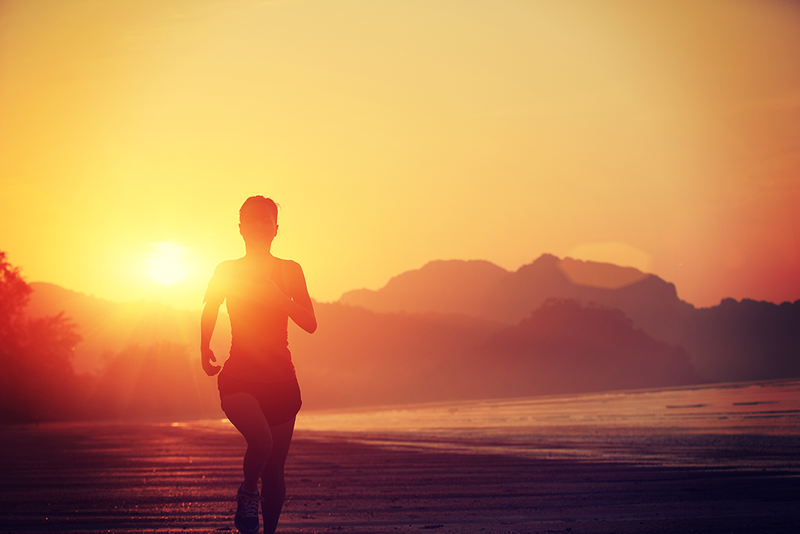 Bridal Boot Camp is a program we have created to help brides and grooms get their skin prepared for their big day! Too many times we have brides and grooms rush to our medical spa with just a few weeks before their wedding and ask to “fix all of this”. We are able to help those individuals the best we can in a short period of time, but it made us begin to think, we really should be helping these couples get ready in advance to put their best face forward. So whether you are the bride or groom, or you are looking to purchase a great gift for them, enrolling in this program is a great idea! Save the Date: It’s Our Anniversary – We’re Celebrating with Our Very First “Diamonds & Sapphire” Party! 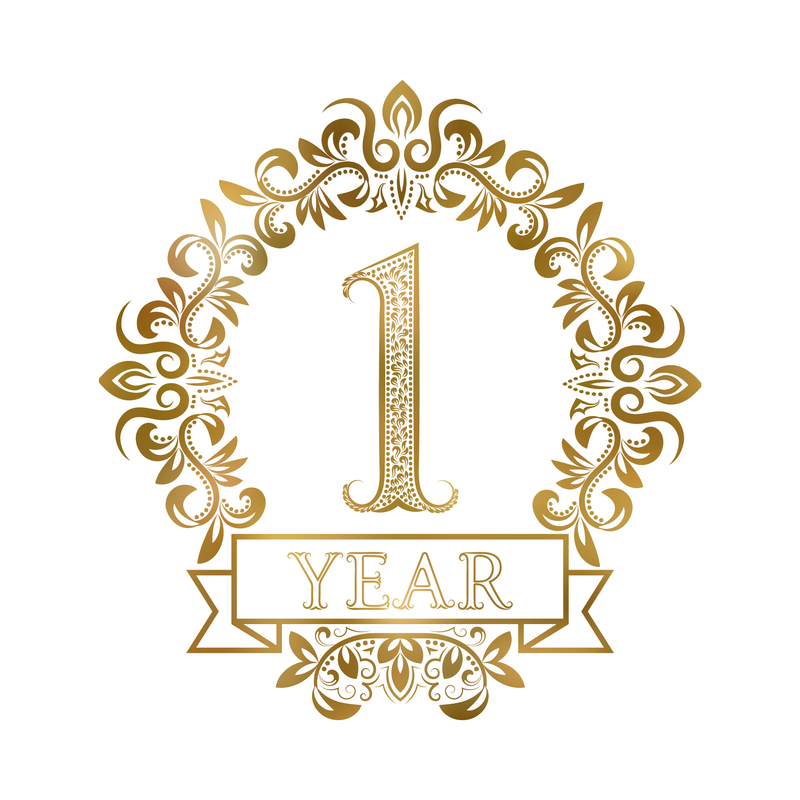 A year really does fly by when you’re treating so many fabulous, wonderful clients. We love you all and can’t wait to celebrate our very first anniversary with you. Thursday, April 20, 2017 | 5:30 p.m. until 8:30 p.m.
You’ll definitely want to be here for our top raffle prize of the evening – something beautiful from our neighbors at JM Edwards Jewelry in Cary! Of course, we’ll have food, champagne, and prizes – if you’ve been to any of our previous events, you know Jennie and Dr. Stevens host a *great* party! More info on the luxe surprises to come… stay tuned. 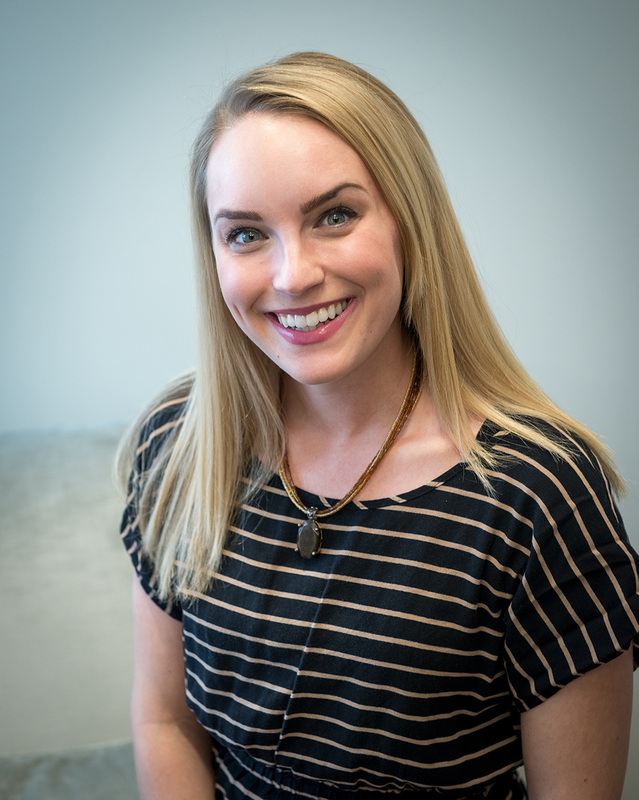 New to the Azura Team: Meet Jordyn! Jordyn is our newest addition to the Azura team and an Aveda-trained licensed aesthetician. She is certified in micro-needling, advanced chemical peels, laser hair removal, along with other numerous procedures. Say “Hi!” to Jordyn during your next visit!